The real thing. The genuine article. A vision so completely fresh, vivacious and original, it defies comparison. No Aerosmith comparisons to speak of. No Hanoi, Dolls, Metallica, ad infinitum. Nope, just the savage chemistry of five distinct personalities playing off and clashing with each other, creating a monstrously distinct, fiercely undisciplined edge ironically tagged Faith No More. Proof-positive individuality pays off - in their case, in spades! They've just finished up a West Coast jaunt supporting none other than mega-gods Metallica, won acclaim from virtually every critical sort under the sun for their sense-shattering The Real Thing LP and seem fast on their way to household-name stature. "It's not like five different people trying to sound like the same individual," mutters crusty geetar wielder Jim Martin. "It's five different jerks struggling to be individuals and creating a band out of that." "I would say that Billy [Gould, bass] and I are bottom, Roddy [Bottum, keyboards] is the melody, Jim is the power, and Mike [Patton, vocals] directs it all," says drummer Mike Bordin, twisting one stalk of his overwhelming crown of dreadlocks. Y'see, along with the likes of Metallica, Living Colour and Soundgarden, Faith No More are part 'n' parcel of metal's most imaginative vanguard, a general movement away from the staid and single-minded state of the scene. They approach their music with the exact same raw inspiration that once made the likes of Led Zeppelin or Black Sabbath so ferociously vital. Check, for instance, their classic Sabbath cover, "War Pigs," a tip of the hat to their most primal influences. "I'm sure the exact same things that are going on in music now were happening in Black Sabbath's time," offers Jim. "They were probably once trying to sound exactly like someone eise and, for one reason or another, just couldn't, so they ended up sounding different. It seems like there's never a lot of different sounding bands at any one time. Sabbath was a band like that, and I think that goes for us as well." 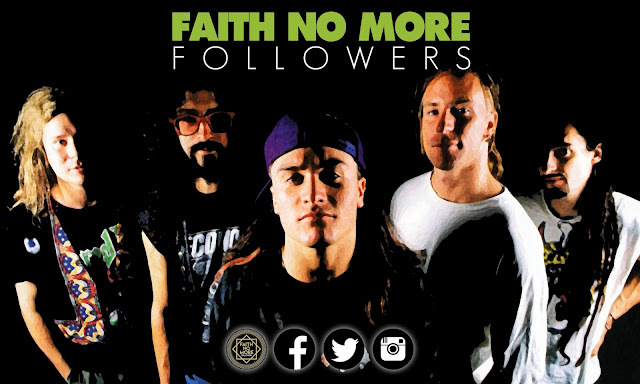 Surprisingly, Faith No More aren't exactly newcomers. 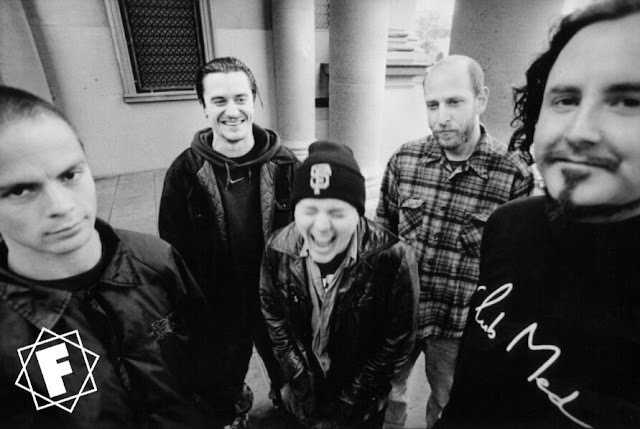 Since 1982 they've been a vital aspect of San Francisco's thriving underground, first as Faith No Man, and later, with the addition of original frontman Chuck Mosley, Faith No More. "The 'Man' wrote the songs," remembers Bordin. "We had to change the name when we kicked him out." A self-financed debut album. We Care a Lot, surfaced on the independent Mordam label in 1986, and the band's first tour was spent crisscrossing the U.S. in a '66 Dodge and stolen trailer. Back-crunching roadwork eventually paid off. The pile-driving metal rap "We Care a Lot" scored high as a college-radio anthem. Slash Records was quick to sign the band, resulting in the '87 Introduce Yourself platter. Relations with vocalist Mosley fell apart following a phenomenally successful European tour. better, he didn't like any of us personally, and when he said in an interview that he was too scared to quit, we figured it was time to show him the door"
Billy interrupts. "He didn't really like our music. In the same interview he called us 'evil, totally evil'. That kind of hurt our feelings"
Mosley, history. Enter Mr. Mike Patton, 21, also vocalist for San Fran funk metallers, Mr. Bungle, a part-time outfit he still fronts at rare one-off gigs. From a whisper to a scream, he's undoubtedly the superior man. He raps, croons, stage dives and slashes himself to bits on whatever broken glass he stumbles across. "They wanted David Lee and got me," chuckles Patton, a self proclaimed klutz currently recovering from an onstage mishap that severely damaged tendons and nerves in his right hand. 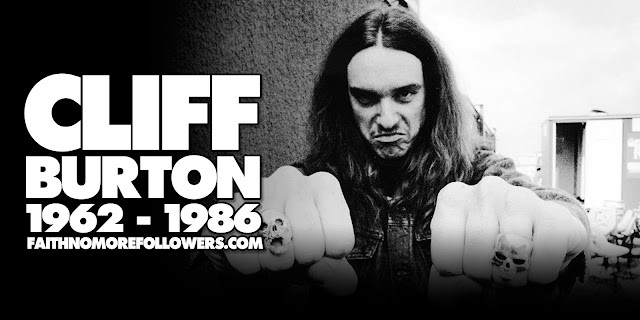 "I lost control, totally lost control, one night when we were playing at the Stone in San Francisco and slashed myself on a broken beer bottle at the front of the stage, I didn't feel it at first, but all of a sudden there was blood everywhere. They rushed me off for microscopic surgery and luckily saved the hand. It's taken about half a year to heal totally and a few months to get movement back. What do you expect?" continues Patton. "It's big, powerful music that makes me want to thump around. It's gigantic and ugly in a beautiful way. A big part of this for me is fear - fear of relationships, fear of loneliness. It makes you do things like avoid feelings or avoid people or walk down the street in an entirely different way." be. I've always been afraid of falling in. Who knows what's down there? Alligators? Rats? Monsters? "There's a full range of subjects and stories on the album. There's one song, 'Zombie Eaters,' which is about babies and how you can warp them and totally f? !k them up. it was inspired by a friend of mine who was baby-sitting this little kid. He would do things like blindfold him and teach him nonsense words. After a little while, the kid was. . .radical. "it's funny," he finishes. "In a lot of ways, as I wrote in the song 'The Real Thing' a lot of what we're about is a celebration, a real 'go out and kill the grizzly bear' primal urge, something to go out and scream your head off about."